Scientists from Lassonde School of Engineering’s Planetary Volatiles Laboratory at York University will be hosting the simulation and talks at the Ontario Science Centre. TORONTO, Wednesday, July 25, 2018 – As Mars moves the closest to Earth it has been in 15 years, the Lassonde School of Engineering’s Planetary Volatiles Laboratory at York University will host a Rover Exploration Challenge July 28 and 29 at the Ontario Science Centre. “It’s a chance for people ages 8 and up to experience what it’s like to be a space scientist or engineer,” said Lassonde Assistant Professor John Moores. Participants will work as a team to remotely operate an analogue rover in a simulated mission, exploring a mystery planet using instruments similar to what is used on rover missions to Mars. There will also be two talks by scientists from the Planetary Volatiles Laboratory on the history of exploration and latest discoveries on the red planet. 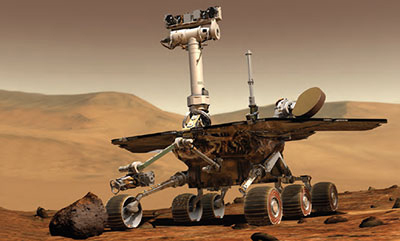 WHO: Assistant Professor of space engineering John Moores (12:30pm) and Post-doctoral Fellow Christina Smith (1:30pm) will give talks on about the robotic missions to Mars and the latest research and discoveries on the red planet.